ArcGIS Server provides secure, focused user access to hundreds of data layers. Engineers now have a hands-on swipe tool that helps identify changes. ArcGIS Server helped BP Azerbaijan minimize custom code. Currently celebrating its 100th year of operations, British Petroleum (BP) is one of the largest energy companies in the world, employing 92,000 people in more than 100 countries across six continents. BP's primary operations involve finding, extracting, and transporting oil and gas to create a variety of consumer products, such as gasoline and home heating oil. Every weld in the 1,768-kilometer-long Baku-Tbilisi-Ceyhan pipeline is registered in BP Azerbaijan's GIS. The easiest way for a pipeline engineer to locate a weld is by using its x,y,z coordinates. One of those countries is Azerbaijan. Nestled east of Turkey, south of Georgia, north of Iran, and west of the landlocked Caspian Sea, Azerbaijan straddles the border between eastern Europe and Eurasia. Though it is a relatively small nation, its extensive and strategically located oil reserves led BP to quickly establish operations in Azerbaijan following the dissolution of the Soviet Union in the early 1990s. With production levels at 3.8 million barrels of oil per day, BP Azerbaijan relies on pipelines and a fleet of tankers to transport the oil worldwide. Given its landlocked geography, BP Azerbaijan makes extensive use of pipelines and manages four of them, including the Baku-Tbilisi-Ceyhan (BTC) pipeline. After years of route planning and construction to address political, geographic, and environmental considerations associated with opening the flow of Caspian region oil to western markets, the BTC pipeline began moving crude oil in 2005. Spanning 1,099 miles (1,768 km) of often challenging terrain—including several mountain ranges and 1,500 watercourses—the BTC pipeline is the second longest in the world. Bypassing the congested sea-lanes of the Bosphorus Strait, it transports over a million barrels of crude oil per day from a marine terminal near Azerbaijan's capital city of Baku, through Georgia, to the Mediterranean coast of Turkey, where it is transferred to tankers for shipping to Europe. To help manage the complex planning and construction of the BTC pipeline, the GIS team of BP Azerbaijan used both an internal ArcGIS Desktop application and an external, Web-based ArcIMS application for sharing data with the engineers responsible for routing the pipeline. This publicly accessible Web mapping application also supported external agencies responsible for making complex and important decisions concerning land management, transportation, and environmental assessment. "As the project progressed, we started identifying newer and more powerful uses for GIS," explains GIS team leader Emin Hamidov. For example, the GIS team used polygons on the pipeline's map to represent the progress of each of the nine steps involved in laying pipe: grading, trenching, pipe stringing, welding, nondestructive testing, joint coating, lowering, backfilling, and reinstatement. Working concurrently on different steps kept the work on schedule, but all effort had to be carefully balanced against sequencing constraints, like the safety standards that limited the length of trench that could be dug before the previous section was backfilled. By updating the polygons daily with the data coming in from the field, the team members were able to see the point to which each step had been completed. From this, they determined how to optimize progress and prevent equipment from sitting idle. By the time oil started flowing through the pipeline in 2005, the GIS team members were already contemplating how to refocus their Web-based GIS efforts to meet changing stakeholder requirements. While the existing ArcIMS system was designed to manage pipeline planning and construction, the team's custom applications had never been intended to provide the functionality BP Azerbaijan needed for managing operations on an ongoing basis once pipeline construction had been completed. For example, one feature the team was keen to introduce to the Web was a pipeline profile tool that would show the depth of ground cover along the full length of the pipeline. "If you need to do some excavation work, this is very important," explains Hamidov. "It's one thing to click on a point to see the data and quite another to look at the profile. You can very quickly see where the thin bits are." BP Azerbaijan operates four pipelines that transport crude oil from the Caspian Sea to the Mediterranean and Black seas. Pipeline engineers use satellite imagery to help monitor changes to the landscape over time. Another feature Hamidov and his team desired was a swipe tool that could be used to slide a layer aside. "Every year we order satellite imagery. The swipe tool is a hands-on tool for the engineers that helps identify changes. You can swipe one image on top of another and quickly pick up the changes in a particular area," he says. Rather than reengineer BP Azerbaijan's existing ArcIMS Web GIS application, it appeared sensible to leverage Esri's new ArcGIS Server technology to meet its next-generation requirements; ArcIMS had been an excellent mapping engine, but ArcGIS Server provides access to the full power of Esri GIS via the Web. A core aspect of BP Azerbaijan's strategy for the future was to minimize custom code while ensuring a solution that would evolve over time with core Esri technology. The GIS team also believed that an off-the-shelf solution used in conjunction with ArcGIS Server was key to ensuring the new system's extensibility and longevity in a way that no custom solution could. The search for solutions that provided additional out-of-the-box functionality for ArcGIS Server led the team to Geocortex Essentials, an add-on product developed by Esri Business Partner Latitude Geographics Group Ltd. of Victoria, British Columbia, Canada, to deliver extensive features and development options for ArcGIS Server. Although Geocortex Essentials offered much of the required functionality out of the box, BP Azerbaijan sought a number of supplemental features to be incorporated into the core product. This shifted the long-term responsibility for maintaining such features to Latitude Geographics and prevented the support challenges BP Azerbaijan had faced with custom-coded features built for its previous system. "By the time the project was complete," observes Hamidov, "we had about 95 percent of the functions we required through core Geocortex Essentials. This was very important to us." Seven new applications powered by ArcGIS Server, deployed by BP Azerbaijan, provide secure, targeted user access to hundreds of data layers that assist informed decision making. 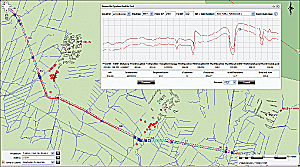 In addition to Web-based pipeline profiling tools and layer swipe tools that provide enhanced visualization, the applications also offer custom map reference grids for large-format, template-based printing; reprojection of map data according to custom projections; uploadable and linked images to the map; and the performance of specialized coordinate-based map requests. Taken together, such features have extended BP Azerbaijan's ability to couple the power of GIS with everyday workflows for nonspecialist users. 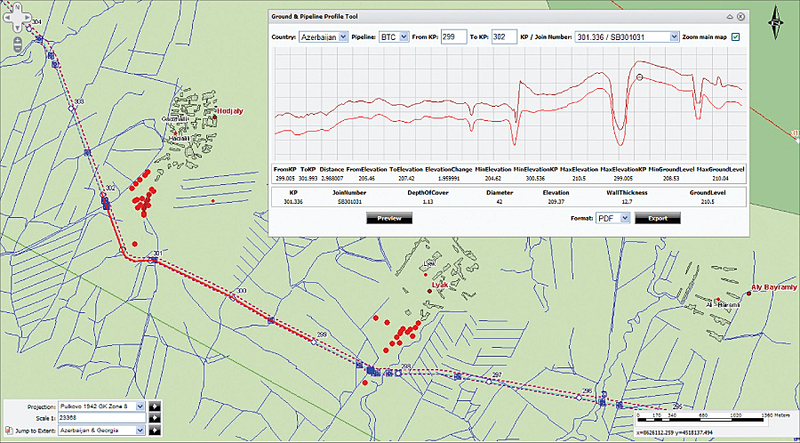 To support the ArcGIS Server implementation, the GIS team also uses Geocortex Optimizer, another add-on product developed by Latitude Geographics, designed to track site usage, improve application usability, and support the creation of monthly management reports to empirically demonstrate systemwide return on investment. With the production system well received by users, BP Azerbaijan project manager Govsiya Maniyeva notes, "The outcome of this project has been a system that provides not only what BP Azerbaijan needs now but also the technology foundation to meet the long-term requirements of our organization." For more information, contact Govsiya Maniyeva, project manager, BP Azerbaijan (e-mail: maniyegr@bp.com), or Tom Kasmer, project manager, Latitude Geographics (tkasmer@latitudegeo.com).